(Newser) – In what Australian authorities are calling a deliberate "act of evil," an SUV plowed into Christmas shoppers on one of Melbourne's busiest streets Thursday afternoon, injuring at least 19 people. 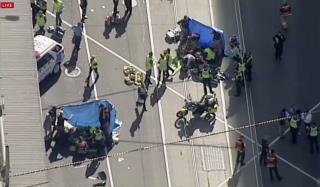 Authorities say at least a dozen people were hospitalized after the attack outside Flinders Street station, including four in critical condition and a pre-school child in serious condition with a head injury, CNN reports. Police say after the white SUV crashed into a bollard, a nearby off-duty police officer entered the vehicle to detain the driver before armed police arrived, reports the Melbourne Herald-Sun, which identifies the suspect as 32-year-old Afghan-Australian Saeed Noori. The off-duty officer was injured in the struggle with the driver and was hospitalized. Police say the suspect has a history of mental health and drug abuse issues and there is no evidence at this time that the attack was terror-related, the AP reports. A second man was arrested at the scene after police saw him filming and found knives in his possession, but police say they do not believe he was involved, the Sydney Morning Herald reports. Victoria State Premier Daniel Andrews called the attack "an act of evil and act of cowardice at a time of a year when people should be out celebrating and doing their Christmas shopping." He praised the off-duty officer for helping to prevent further carnage. Would have been a lot worse had this guy been carrying an AR15.